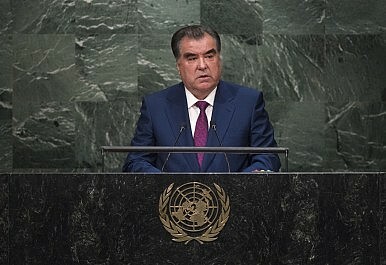 Just in case it wasn’t clear, Emomali Rahmon is likely to be named the Leader of the Nation. Perhaps the only thing surprising about the news that a group of Tajik parliamentarians have worked up a draft law to give President Emomali Rahmon the title “Leader of the Nation” is that it hasn’t happened before. Then again, amid economic downturn, insecurity on the Afghan border, and forced closing of even nominal opposition political parties, the title is a reiteration of who is in charge. Kazakhstan’s Nursultan Nazarbayev was given the title “Leader of the Nation” in 2010, along with immunity in perpetuity and the right to intervene in politics should he ever leave office. The 2010 Kazakh law also grants Nazarbayev a personal exemption from term limits as the country’s first president. Despite recent comments that public servants should retire after 25 years, Nazarbayev has shown no real inclination to follow his own advice. It’s unclear if Rahmon’s pending new title will come with the same kind of perks Nazarbayev’s did. Both Asia-Plus and Eurasianet noted that it probably is geared toward clearing any pesky legal hurdles to Rahmon seeking another term in 2020. In 2003, the country held a constitutional referendum which resulted in setting a two-term limit on the presidency. Rahmon will finish his second (technically his third) 7-year term in 2020. As noted above, the draft law might pave the way for Rahmon to exempt himself from term limits down the line. But the title serves a second purpose: in glorifying Rahmon it feeds into a rewriting of Tajik history via the promotion of the myth that Rahmon singlehandedly ended the civil war. Never mind the opposition, which in 1997, after five years of fighting the state, came to the negotiating table and ultimately walked away with what they wanted: a role in the government. The peace accord mandated that the opposition be given 30 percent of government posts, not a bad deal if it had been kept. But Rahmon began eroding away the deal from the moment it was settled, culminating this year with the labeling of the Islamic Renaissance Party of Tajikistan (IRPT), the main heirs to the opposition, as an extremist group. As there’s little doubt the draft law will pass through Tajikistan’s rubberstamp parliament, the newly named Leader of the Nation will continue to stamp out any remaining flickers of opposition and rewrite history. A Tale of Tajik Air's TroublesTajikistan to Plug Back Into Central Asian Power GridTajikistan's Rogun Dam Begins OperationsSpectacular Cities and Urban Transformation in Central AsiaDid Tajikistan Just Ditch a Rail Project With Turkmenistan?